"That's The Way The Organ Should be Played. 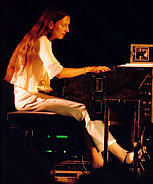 Barbara Dennerlein has indeed developed her own signature sound and approach to the Hammond B3 organ, whereas most organ ensembles include a bassist to lay down the bassline, or use their left hand to play the bassline on the keyboard, Dennerlein uses the foot pedals to play the bassline and she also incorporates the use of Midi technology to further enhance the listener's experience. ... Dennerlein's experimentation and creativity with her own compositions, however, goes beyond her innovations with the bassline, for she is considered to be an artist who blurs the lines between jazz and the blues and the various sub-genres of jazz music. 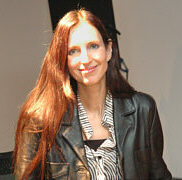 In fact over the years, she has become just as comfortable playing a pipe organ in more classically oriented concerts. On the Hammond B3 she can play a strident up-tempo piece or she can find a deep funky groove, and at other times she treats her fans to a mellower jazz tune." 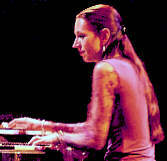 "Vital Organs For German organist Barbara Dennerlein, Jazz lives on pipes as well as Hammond B-3. Search YouTube for Barbara Dennerlein and you're sure to be dazzled by the footage of her footwork, not to mention her hands. She's not an athlete, but a startlingly original musician with a mission: to bring the organ into the 21st century. To that end, Dennerlein performs on both the jazzy Hammond B-3, and its classical predecessor, the churchier, bigger and more complex pipe organ... Dennerlein's worldly, joyous jazz takes you to church whether you're in a club or in a holy place. She's the hottest German jazz export since Klaus Doldinger's band, Passport. ... Dennerlein weaves funk and swing, groove and church, acoustic and electric into her own compositions and the standards she transforms… Barbara Dennerlein is all about the open mind. ... she's not in the tradition of Jimmy Smiths, Johnny "Hammond" Smith, or Jimmy McGriff. Her groove runs deeper and less predictably, largely because of her signature footwork." "Organ virtuoso Barbara Dennerlein works her triple-threat magic. Barbara Dennerlein loves a challenge, and what could be more challenging than multiplying yourself by three time you take the stage? ... Dennerlein is recognized as one of the reigning virtuosos of the Hammond organ, and the master of playing jazz on its even-more-complicated cousin, the pipe organ. But whether she's playing a moody solo improvisation under a soaring cathedral ceiling or speedy post-bop licks in a smoky nightclub, her work is distinguished by her unprecedented ability to be soloist, accoimpanist, and bass player, all at the same time ... it's really amazing ... Dennerlein's remarkable gift of being three musicians at once." Impressions of the 51st Monterey Jazz Festival... Swinging into the Monterey Jazz Festival's final evening, German organist Barbara Dennerlein wastes no time in digging a deep soul-jazz groove. "Easygoing," an original tune with a cool "Killer Joe" walking vibe, finds Dennerlein stretching out almost instantly with a supercharged solo that sounds like it requires three hands. And then, as if to make sure all cylinders are firing at full capacity, she immediately leaps into a second solo, using nothing but the bass pedals at her feet. Having thus established her total mastery of organ-jazz conventions, Dennerlein then proceeds to shatter the mold. Without ever sacrificing the almighty groove, she calmly guides her trio into dense thickets, modernist harmonies and odd meters. Dennerlein possesses awesome technique and a prodigious feel for the dynamic range of her instrument, varying the feel throughout each tune from a whisper to a scream. An accomplished pipe organist as well, Dennerlein frequently makes the B3 mimic its larger cousin, at one point summoning a remarkable 5 second blast like a Bach fugue, a radio soap opera and a sci-fi movie score rolled into one. These are the best moments of the set, with Dennerlein and guitarist Brian Pardo crackling with the concentrated power and focus of a laser beam, rapturous and unrelenting..."
"She swings hard. She exudes more joy than attitude (not that I'm complaining about attitude from B-3 players, I'm just saying). And she plays the pedals as if her feet were fingers, with that much dexterity and speed. I wished I had a clear view of her feet because it seemed she had more than just two....."
"When the Hammond B-3 fraternity's elite gather for a confab, they always save a seat for Barbara Dennerlein. With her fearsome technique and fearless improvisational drive, the brilliant German organist has collaborated with many of jazz's greatest players, from keyboardist Joe Zawinul and trumpeter Randy Brecker to saxophonists David Murray and David Sanchez." "Pedal Power - the virtuosity of organist Barbara Dennerlein. ...a new and distinctive voice on the Hammond has been turning that world upside down... Barbara Dennerlein has been rewriting the rulebook. She combines incredible co-ordination of hands and feet with complete rhythmic freedom. On her brief London appearance, she demonstrated this with originals..., shifting between different metres and chorus lengths...she proved she could be just as inventive and free within the standard repertoire. Opening with a bluesy tribute to Jimmy Smith she showed just how far she has moved forward from his style of playing. "Her harmonic sense and ear for fresh melody can make even the most road-battered blues sound like she only just thought of it...Dennerlein's balletic footwork is one of the attractions of her gigs." "...swings, moans, rocks, and rolls through unpologetically familiar territory, powered by a B-3 that's as funky and down to earth as a house party on a hot summer night...and her fat, funky comping provides a rich, soulful bedrock for the band to groove on." "A fast-paced, funky band anchored by the fleet-fingered and fluid organ-player named Barbara Dennerlein brought a packed, foot-tapping audience to its feet at the Spectrum last night"
"...she plays idiomatically; not only does she swing, and hard, but she also genuinely knows the language, replete with excess and funk bass lines." "German Organist Pumps You Up"
"JAZZ ORGAN LIKE YOU'VE NEVER HEARD IT. Barbara Dennerlein ... has pulled off perhaps the most formidable feat in jazz - one that has stumped many American players more than twice her age: She's established herself as an original on an instrument where originality is as rare as a California rainstorm. Arguably, Dennerlein is the first artist since Larry Young to free the Hammond organ from the shadows of Jimmy Smith and cast it in an entirely new light. Nearly every B-3 specialist to emerge over the past three decades has, to a degree, presented only one or another variation on Smith's approach. The same funky feels, the same percussion chuffs, the same riffs and repeated notes, and apparently the same tenor sax player, have been trotted out by Brothers, Grooves, and Wild Bills time and again. Though not mere carbon copies of Smith, the top players in this league create an impression of sameness that the top pianists, drummers, and even bass players manage to avoid. Not so with Dennerlein. Despite to an occasional nod to her instrument's ribs-and-grits tradition, she prefers to explore more modern and varied terrain... The title cut from 'Hot Stuff ' alternately strolls and sprints through more vividly contrasting episodes than many jazz organists traverse in a lifetime... Her solos avoid patent Smithian effects: Instead, she thinks like a horn player, preferring coherent long lines to stuttering single-key repetitions or gimmicky sustained high notes. Then there's those feet. Simply put, Dennerlein has astonishing bass pedal chops. Not only does she step nimbly through rapid tempos, she even takes pedal solos - ... a foot bass extemporization that would do Stanley Clarke proud. And listen to Dennerlein's left hand: Unlike thoses organists whose proclamations of pedal-pushing virtuousity are less than candid, Dennerlein does not cheat by sneaking bass lines onto the organ's lower manual. At the speediest clip, she can simultaniously solo, comp, and walk that bass with remarkable precision. "Hard to imagine a greater contrast than that offered by powerhouse organist Barbara Dennerlein in the Jazz Club Casino. ...with drummer Pius Baschnagel in tow. This was my first-ever sighting of this superb German musician, seated like a flight-deck commander at her console, twisting and turning, the basslines moving all the time, the sheer drive and swing of her opening blues like a glimpse of mainstream heaven."